Kane - This latest Elite Kane figure is based off of his current incarnation. 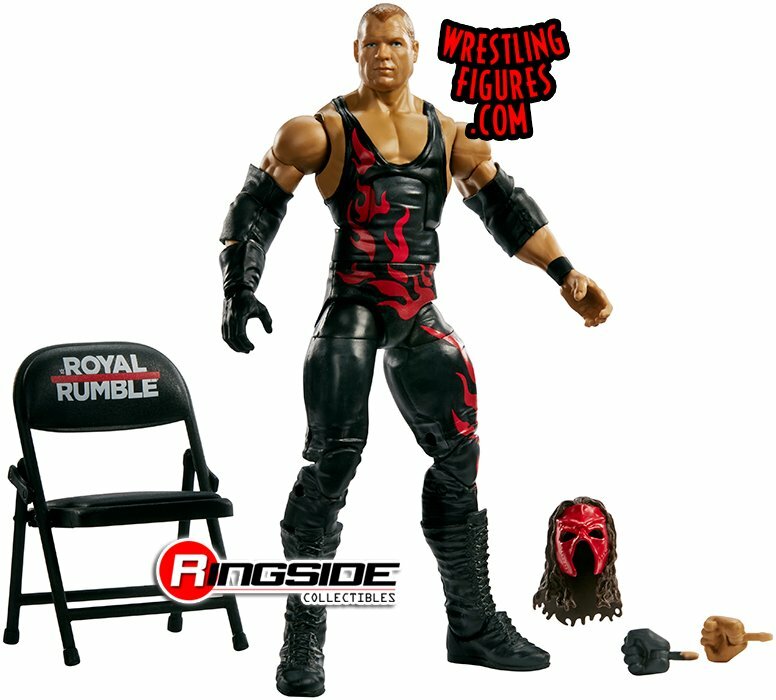 "The Big Red Machine" has a removable mask, and a steel chair from match match at the Royal Rumble earlier this year. His ring gear is accurately recreated as well. Sami Zayn - The newest Zayn figure is recreated from his time teaming up with Kevin Owens last year. The figure has a delighted and upbeat headscan, a removable hat, and even a "Yep Movement" shirt for the figure. Dean Ambrose - He may not be in The Shield any longer, but this Ambrose Elite figure is based off of his look from the Shield reunion in 2017. Ambrose has his longer hair and full black Shield gear. Plenty of plunder is appropriately included here, such as a ladder and a steel chair. Shinsuke Nakamura - Nakamura has an impressively realistic and expressive headscan here. The current United States Champion in WWE is also completely decked out in red ring gear with black stripes, and "The King of Strong Style" has a matching removable entrance jacket. Nakamura comes with two hands specifically designed to recreate some of the signature poses that have become associated with him over the year. Shelton Benjamin - This is a bit of an interesting figure as there are actually two different versions of it available to buy. The first figure is based off of his current look and comes with a ladder. The second figure that can be purchased is a "Flashback" figure recreating Shelton's "Gold Standard" run. This Benjamin figure is made in gold ring gear, he has blonde hair, and it comes with a ladder as well. Dusty Rhodes - Finally, the late Dusty Rhodes' newest Elite figure is stunningly designed to include accurate ring gear, elbow pads, boots, and facial expression. The "Common Man" also includes a removable hat, shirt, sunglasses, and world title. Each of these figure can be purchased now right over here.